Both activities are offered on site at Highland Adventure Centre in a 2.5 hour session. Our Instructors will outfit you with a helmet and harness and give full tuition to build up confidence and skill in tackling all 3 challenges. We have a variety of climbing routes for all levels of ability in Wall Climbing. The first step backwards into the void is what abseiling is all about and it will give you an adrenaline rush especially if it’s your first time! 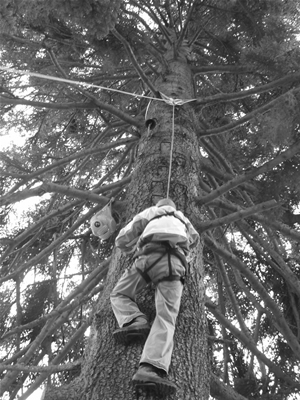 Clients use the staples in order to get to the top of the Tree Climb and ring the bell as recognition of success. Guaranteed to be an exciting, challenging and rewarding experience. © Highland Adventure. All rights reserved.